You killed our baby. You don't ever forget that! 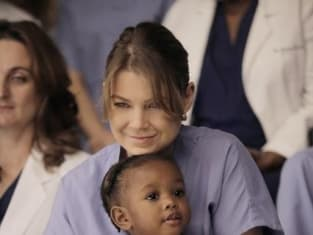 Grey's Anatomy Season 8 Episode 12: "Hope for the Hopeless"
Permalink: Love you. See ya. There's nothing else we can do for you. These are the last words a surgeon wants to tell a patient. Getting up doesn't come easy to us, so we do everything in our power not to. For surgeons, lost cause just means try a little harder. Grey's Anatomy Round Table: "Hope For the Hopeless"
Grey's Anatomy Music From "Hope For the Hopeless"